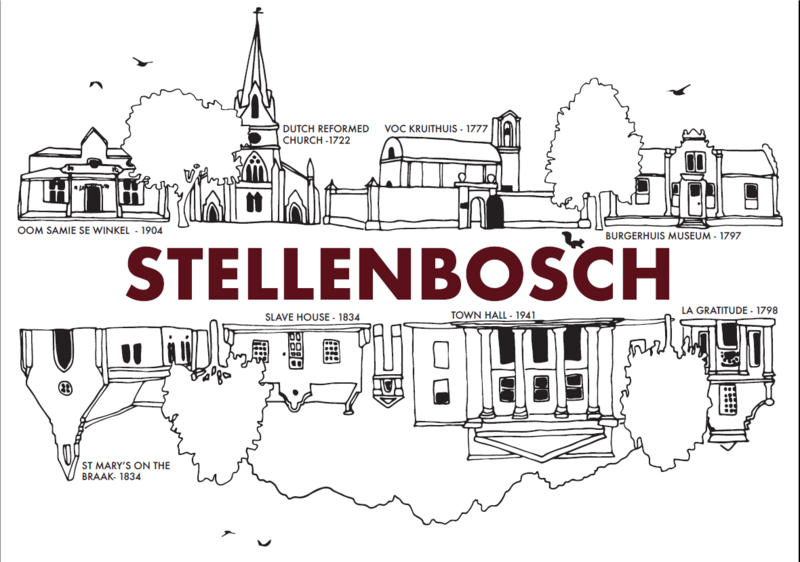 Have YOU walked Stellenbosch? T-shirt design competition takes a trip down memory lane As part of a recent collaboration between Innovus, SunCom and the Visual Arts Department of Stellenbosch University (SU), a design competition was held for the Visual Arts students that would take the most contemporary representations of our town and University, create t-shirts from them, and make them available to everyone. Many of the innovations and inventors that Innovus supports are scientific in nature, but our mandate is to encourage the unique talents and potential contributions of anyone in the SU family, and put them to commercial use. And, as most science is part art anyway, that is where we recently decided to focus. Sitting, studying within the Visual Arts Department are some of South Africa’s next big names in graphic, information and instructional design and visual storytelling. To encourage them to come to the fore we ran a competition, in which we challenged them to conceptualise the uniqueness of our beautiful town and University in one design. This competition, hopefully the first of many, showed just what kind of functionally creative chops our visual arts students have. The task given was to interpret the theme ‘My Stellenbosch’, in a way that would appeal to fellow students, tourists and locals. 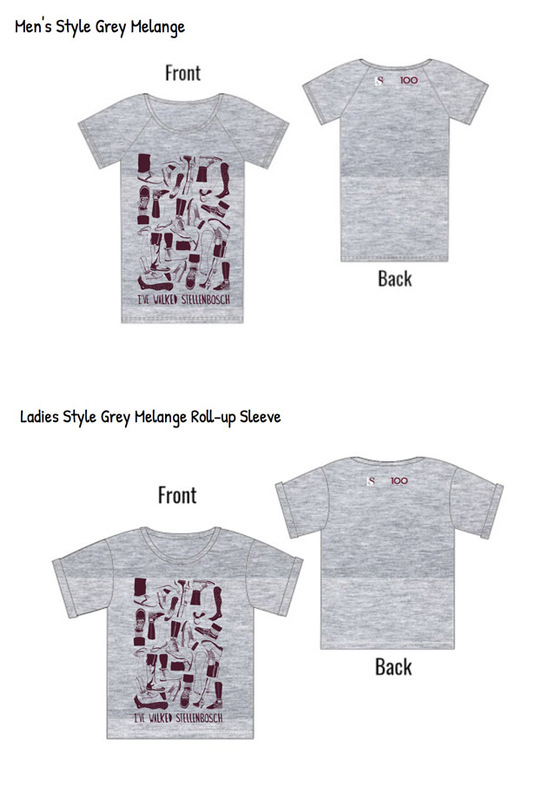 As this is a proud Stellenbosch University initiative, the winning design would be printed onto t-shirts, and sold in the Maties Shop, both in town and at the Neelsie. We expected great, but what we received were designs of exceptionally high quality, thoughtful and creative interpretations of the theme and a fresh insight into students’ perspective of Stellenbosch (as a town and a place of study). The winner of the competition was Ulrike Mieke, a 4th year student in BA Visual Communication Design and a talent to watch out for in the future. Her design ‘I’ve walked Stellenbosch’ touched on the perambulatory nature of our area, and the diversity of the people who traverse it daily. 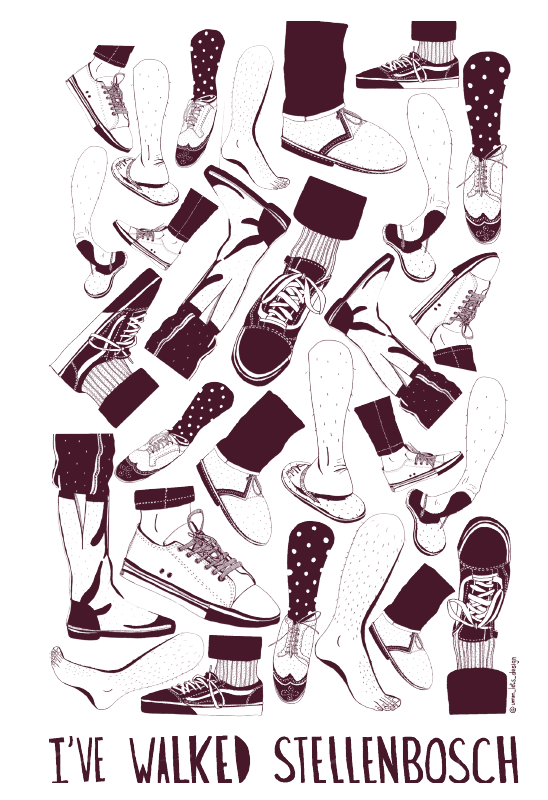 She was inspired by watching fellow students as they moved and flowed between different locations, and how each person’s footwear was representative of an individual identity and unique persona. She captured this perfectly in a montage of different feet – some in boots, some in flip-flops, others in vellies or barefoot. “Shoes take you everywhere you want to go,” she says. Her design was hand-drawn and hand painted in detail, before being digitised. 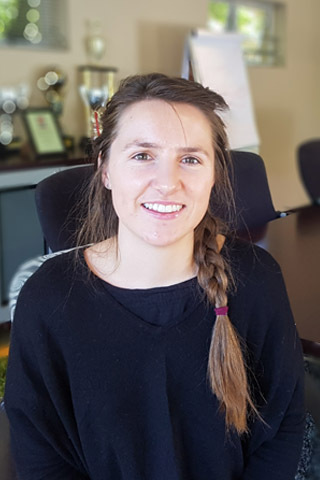 Ulrike will continue with her postgraduate studies in the BA Honours programme in Visual Arts (Illustration) next year, specifically to move into the world of packaging design. 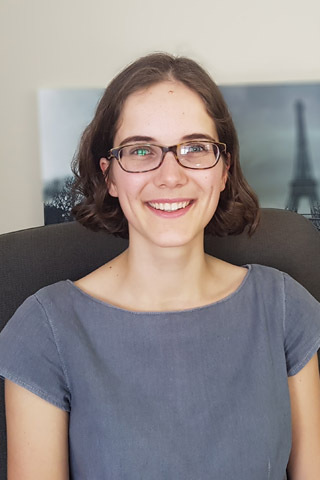 She is also making Stellenbosch University and Visual Arts Community extremely proud by being one of only two South African artists (among only 20 selected worldwide) that were chosen to attend a workshop at the world famous Angoulême International Comics Festival in France in January 2019. 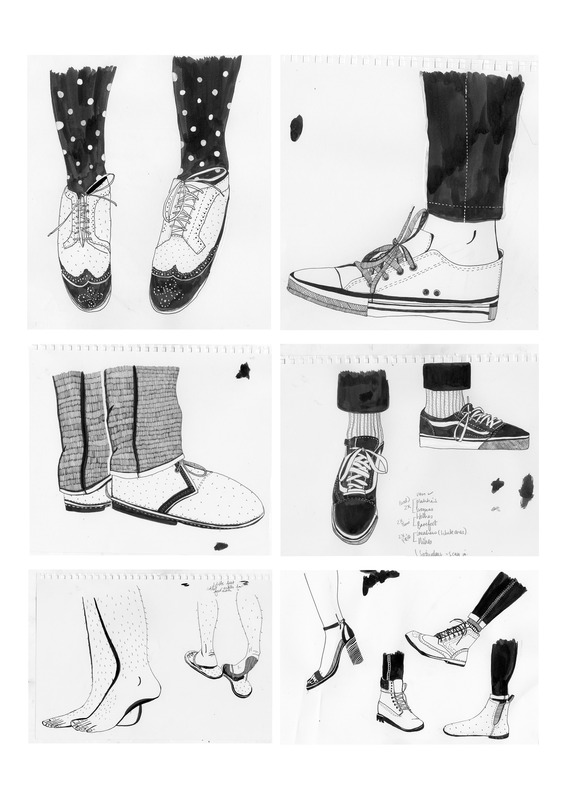 The runner-up was a 2nd year student, also busy with her BA Visual Communications Design degree, Jana Lombard. She interpreted the brief by sketching in smooth, elegant lines the historic buildings that are the bedrock of Stellenbosch. Our history in this town is very rich and makes us who we are, and it’s this aspect she wanted to share with the rest of us, so we can relive it. Our home is, after all, almost 400 years old. An artisan by nature, Jana has grown up in a family that loves to try their hands at anything they can make or bake, so creativity is her predominant nature. She, too, will be focussing on illustration, and graphic design, as she continues her studies. 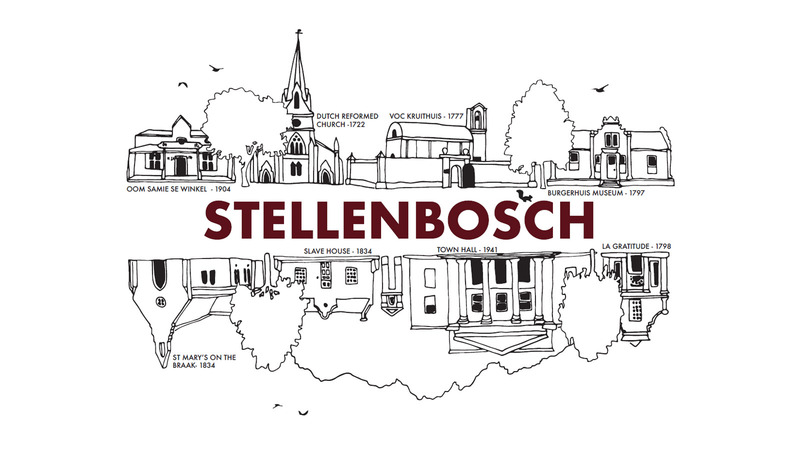 The winning design will take its place on the shelves of the Maties Store in the Neelsie and on Dorp Street very soon, so you will be able to proudly showcase your Stellenbosch roots wherever your travels might take you. For those reading this with a sense of Fear of Missing out (FOMO), we aim to run another competition next year in order to give students the opportunity to have some input in the fashion and designs we sell in Maties shops. We want designs for students, by students. For the less artistically-minded, we would like to recommend that you draw inspiration by checking out the adroitness of the next swatch of graduating visual communication design artists at the annual GradEx, arranged by the final years, which will be running from the Gallery University of Stellenbosch (GUS) in Dorp Street from 7 – 14 December. When you buy one of these designs, you do not just buy a piece of Stellenbosch, you buy a part of the artist who created them - one of our own. It is good for the area, the creator and the University. It gives real-world application to ideas. And that is what innovation is all about.